Snow shower or two. Windy. You too buddy! I was not riding at capacity, although it seemed to help the torn hammy, so got better as the days went by. Had a hoot of a last run, late today, solo, no one behind, no one in front that got in my way, T2B. My previous attempt was thwarted by people crashing in front of me (not crew). One a truly impressive OTB, if it was me it would have been chopper time, young bendy thing, got up, all OK! LaNeige: Perfect summers day. The view was accompanied by the grumble of Gunbarrel warming up. First crack at TVT today. Mix reviews from one and two, might be due to a couple of stacks, actually having to exercise or the ridiculous heat. But as a bonus plus 1 loved it. That green stuff looks so carvable. Do the train tracks you leave get groomed out over night? Perfect summers day. The view was accompanied by the grumble of Gunbarrel warming up. First crack at TVT today. Mix reviews from one and two, might be due to a couple of stacks, actually having to exercise or the ridiculous heat. But as a bonus plus 1 loved it. Happy 'Myer & DJ Sale Day'! Thanks for the heads up. I use Tele gear btw, but increasingly ski parallel turns on lifts as the body complains. BC, I Tele where & when possible - Otherwise I could spend another $2.5K & go AT. But that's way OT for Stirling & Baw Baw & most of the BHPs. And the BC runs at Hotham are not that long so Tele still works for me! Thanx for the pics people, I don't think I'll bother with skis - Looks more like remnant cornices. Our Gang hope to take the sprigs to Kosi for a nice chilled day. It will be much more sociable if I keep on the path with the walkers, rather than veer miles off track for my 2-4 turns. Anyway, another 6-7 months I'll be sliding again somewhere. Cheers all - enjoy your adventures over the Globally heated New Year! snowgum: Howdy, Happy Christmas everyone. 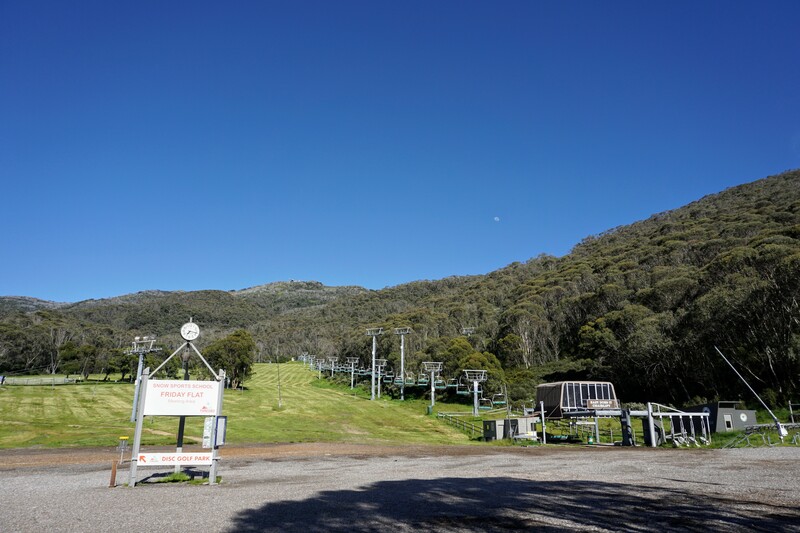 Fwiw, I'm heading up to Thredbo shortly and was wondering whether there's long enough drifts up high to get a little slide - say 10-15 turns? Or is it really, 1-2 turn stuff? Thanks in advance if anyone can advise and if affirmative, the location. Take care, SG. Maybe 3 or 4 turns on Summer drift. Ego Alley 2 turns. There's still a lump from one of the jumps on Antons and above Cruiser. Oh, maybe 4 or 5 turns on the drift in The Falls. I've had a look to see any ski tracks. None. Dunno what rides. Can�t say I�ve thought it makes a difference. But then I�ve never not been on Telemark kit. Given the temps that night, might be a bit of freeze/thaw going on. How small can you turn? Howdy, Happy Christmas everyone. Fwiw, I'm heading up to Thredbo shortly and was wondering whether there's long enough drifts up high to get a little slide - say 10-15 turns? Or is it really, 1-2 turn stuff? Thanks in advance if anyone can advise and if affirmative, the location. Take care, SG. Telecrag I believe that they are also going to put a green run from Gunbarrel with the new intermediate run pre-Christmas and the easier one early next year (at least that is what they said at the pre-summer info session). Not a lot of trail building going on today! iagreewithhim: Hard to see how he can get the rotation, with balls that size! telecrag: Oh look, the Basin live cam got some footage of me in action this morning!